Five years ago this week, separatist rebels attacked a small school in Beslan in North Ossetia. On the third day of the attack, at least 330 people were killed, more than half of them children. The attack was said to have altered the whole arc of not only the horrific conflict in nearby Chechnya but also the presidency of Vladimir Putin. Beslan was supposed to have given Moscow resolve. North Ossetia  indeed, the whole of the North Caucasus, between the Black Sea to the west and the Caspian Sea to the east  was supposed to be tranquil, harmonious, subdued. But that's not what has happened. The Russians invaded Chechnya in 1994 to try to keep it part of Russia. They failed. In 1999, three years after the end of the first Chechen war, they went back, at the prodding of then Prime Minister Vladimir Putin. In a move reminiscent of Tolstoy's hundred-year-old Hadji Murad  which was also set in a strife-ridden Caucasus  the chief separatist, Akhmad Kadyrov, like the title character in the prescient short novel, switched sides at the beginning of the second Chechen war and crushed the rebellion. Assassinated in May 2004, Kadyrov was replaced by his son. 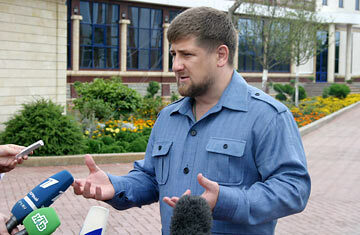 Ramzan Kadyrov, now 32, has ruled the mostly Muslim Chechen Republic (pop. 1.1 million) ever since, and by 2008, his allies in the Kremlin were declaring victory. All the violence  the virtual razing of the capital, Grozny; the ferocious attacks by rebels  was supposed to be over. The horrible seige at Beslan and, later, the bloody assaults on a Moscow theater and a crowded underpass and the Chechen war exported into the rest of Russia were supposed to be things of the past. But now the violence is flaring up again. And suddenly it's not just Chechnya. Neighboring Dagestan and Ingushetia are hotbeds of instability, as are North Ossetia and, to the immediate northwest, Kabardino-Balkaria, with seemingly random shootings, bombings, kidnappings and armed conflicts among rebels, Islamic separatists, local militia and Russian troops. Doku Umarov, a separatist leader, declared in April that Riyad-us Salihin, or Guardians of the Righteous, a band of suicide bombers organized in the earlier part of the 2000s by now deceased radical separatist Shamil Basayev, had been revived after several years of lying dormant. In late June, Yunus-Bek Yevkurov, the President of Ingushetia, was severely wounded when his motorcade was bombed. In mid-August, Islamic extremists in Buynaksk, in Dagestan, attacked police at a sauna that also served as a brothel, killing four officers and seven prostitutes. Three days later, in Nazran, in Ingushetia, a suicide bomber drove a car into a police building. The powerful explosion killed 21 and left 138 injured. Ten children were among the dead. Alexey Malashenko, a North Caucasus specialist at the Carnegie Moscow Center, portrayed the violence in the region as part of a nearly 20-year intermittent struggle inaugurated by the collapse of the Soviet Union. Malashenko and Gregory Shvedov, the editor-in-chief of Caucasian Knot, an Internet news site that has drawn unwanted attention from authorities, attributed the bloodshed to Islamic extremism and corrupt government officials in Grozny, the Chechen capital; Makhachkala, the Dagestani capital; and Magas, the Ingushetian capital. "There is no access to any freedoms, political and civil freedoms, including religious freedoms, which is fueling the situation," Shvedov said. Other compounding factors include high unemployment  in Ingushetia, the worst off, unemployment has hit 70%  and a Kremlin that has placed too much faith in client-states to keep the peace. Exhibit A: Ramzan Kadyrov. Kadyrov was hailed as a success by Putin, who has painted himself as a strongman who brought peace and prosperity to Russia. But Kadyrov is a thug whose militia are guilty of every human-rights abuse imaginable; when the Russians ended their 10-year counterterrorism operations in the region earlier this year, violence surged. A recent poll conducted by the Levada Center, a Moscow-based NGO, found that Russians are increasingly pessimistic about their southern fringe. Denis Volkov, a researcher at the center, noted that the survey showed 46% of Russians have faith in the authorities to bring peace to the North Caucasus. Five years ago, that figure was above 60%. Malashenko says there is no end in sight: "We should be prepared for a continuation of this state of latent civil war."